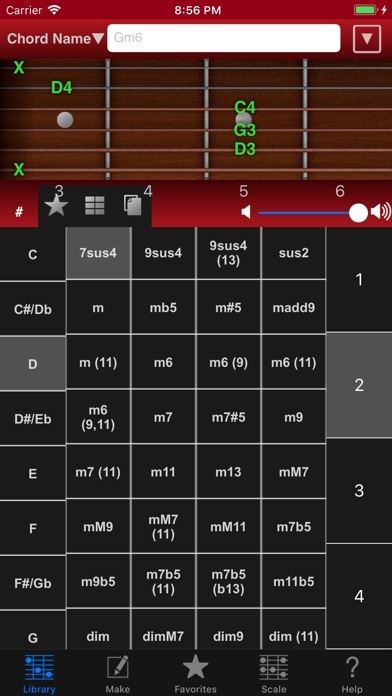 The most excellent Guitar Chord Form tool in the world, in your pocket! You can search almost chord form and display it. Guitar Kit has enough huge preset library. You can directly select a chord form by smooth scrolling Chord Picker or focus on a little chord forms by typing a part of chord name. You can search by various Enharmonic Equivalents. If you tap the top guitar diagram, Guitar Kit play each note. And if you select a chord in the list or picker, play chord any times. Favorites Tab allows to memory your favorite chord forms. And Sheet allows to view more than one chord, so itâ€™s especially convenient for you to confirm chord forms in specific song. Sheet support Black and White mode, it looks like chord forms paper sheet. Display doesnâ€™t dim during working. It can be trusted to think other thing or play songs. And you can handle multiple songs by â€œExport Sheet as Native Formatâ€ feature. Make Tab allows you to create your original chord forms. You can handle them as like preset library completely. Of course you can add new chord form similar to existing chord form using Reproduce Form function easily. And you can slide decided chord form to left or right. So youâ€™ll be able to add chord forms changed Root note in succession. Suggest Form function offers randomly new chord form contains selected notes. And Guess Chord Name function suggests chord names by decided chord form or selected notes on 1 octave keyboard. Scale Tab allows to show many popular scales. And also you can find matched chords with a scale you selected. You can change mode to left hand or right hand for all frets. And you can toggle setting Note Name / Interval for each note. You can back up data youâ€™ve created to Mail, Dropbox, box, iCloud Drive and others. And you can restore it at any time. And also, you can export Sheet Chord Forms as SMF(Standard MIDI File) to Mail, Dropbox, box, iCloud Drive and others, so you will be able to use as Chord Progression if you import it to your DAW. By the way, Guitar Kit exports Chord Name as Marker. If you handle Sheet by Guitar Kit only, â€œExport Sheet as Native Formatâ€ function is very easy. Even if some sheet chord forms donâ€™t exist in Library Tab, Native Format can be imported to Sheet exactly. It is like function open and save multiple songs. Quick working and most beautiful Guitar Chord Form app â€œGuitar Kitâ€ is very useful for you, exactly! When youâ€™ll buy this low price add-on, you can use more Chords and Scales. It will provide a complete set usually.